The Center for Disease Control and Prevention states that bicyclists face a higher risk of crash-related injury and deaths than occupants of motor vehicles. With the risk of bike accidents so high, you can expect to get into a bike accident at least once during your bicycling career. If you find yourself in a bike accident, remember to take these steps immediately. Take a moment to evaluate yourself. Common injuries after a bike accident include lacerations, broken bones, whiplash, or concussion. Often, you may feel adrenaline so you may not be aware of your injuries right away. See a doctor as soon as possible, even if you feel fine right after the accident. If you do get medical treatments, keep good documentation of all your medical treatments and expenses for your insurance claim later on. Always exchange insurance information with the other party, even if you do not notice any damage or feel any pain right after the accident. You may develop symptoms later, after the adrenaline wears off, and you want to be able to make an insurance claim for it. It’s true that your car insurance will not cover bicycling accidents. However, did you know that your homeowners or renter’s insurance will pay for damages caused by sporting activities, such as bicycling? Additionally, your personal injury protection insurance may cover your medical bills. Once you finished exchanging information, document the accident. Take pictures of your bike, the car, your injuries, and the immediate surroundings of the accident. If you happened to be wearing a Go-Pro camera, make sure any video of the accident is saved and backed up. If there are witnesses, ask for their contact information. After you get home, take a moment to write down as much as you can remember about the accident. Insurance claims can take a long time, and memory can get fuzzy with time. 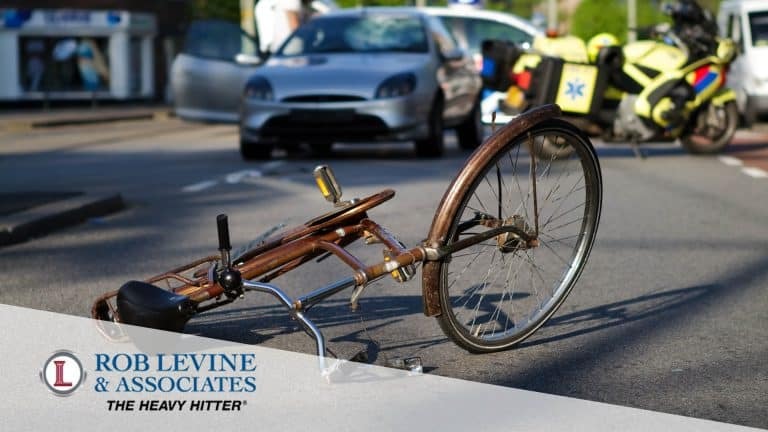 At Rob Levine & Associates we are experienced in personal injury cases in Rhode Island, Massachusetts, and Connecticut. We are also experienced with social security and veteran’s disability cases nationwide. Our team is available 24/7 to help you.